Today, I am posting the last card I made using papers from the WRMK Love Notes collection. The point of these posts was to show you how many different cards you can make out of a single paper pad and how different they can be. While I used the xoxo pattern, triangle pattern, and painted stripes pattern from the set, I also threw in a houndstooth pattern and polka dot pattern from The Paper Studio. I began by die-cutting different sized circles to use for the general balloon's shape. I also cut little triangles for where the balloons are tied. I taped the triangles so that they stick out beneath the triangle and then adhered a piece of black and white baker's twine for the string. I staggered the balloons along the top of the card and adhered them with foam adhesive to help them pop up off the paper like a real balloon would. 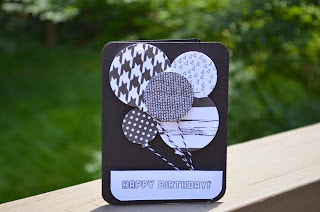 I used a birthday stamp from Simon Says Stamp on a piece of white cardstock at the bottom. I wrapped tape around the end of the string and adhered it under the sentiment so that the strings don't flop everywhere and get damaged. I finished the card by rounding the corners with my round Corner Chomper by WRMK. Thanks for checking out this last Love Notes inspired card! My next series will focus on the Autumn Press collection by Studio Calico. Even though this is a more fall themed paper pad, I want to show you how even seasonal pads can be used for cards all year long. Get the Love Notes Paper Pad here!